VATICAN CITY (CNS) — Lent is a time to shed lazy, un-Christian habits and snap out of one’s apathy toward people harmed by violence, poverty and not having God in their lives, Pope Francis said. Lent is time to “change course, to recover the ability to respond to the reality of evil that always challenges us,” he said during his weekly general audience March 5, Ash Wednesday. The pope’s catechesis focused on the meaning of Lent, which, beginning Ash Wednesday for Latin-rite Catholics, marks a 40-day period of penance, prayer and conversion “in preparation for the church’s annual celebration of the saving mysteries of Christ’s passion, death and resurrection,” he said. Later in the evening, Pope Francis was scheduled to lead a traditional Ash Wednesday procession from Rome’s Basilica of St. Anselm to the Basilica of Santa Sabina for Mass and the imposition of ashes. 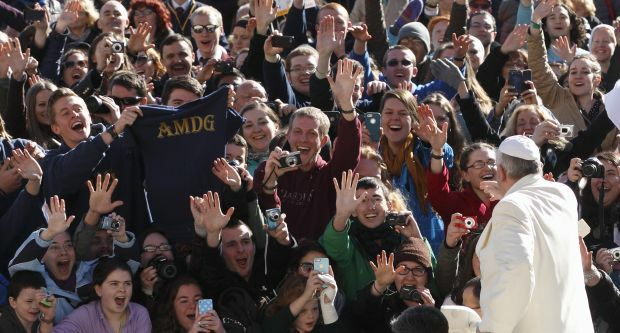 At his morning audience, he explained that Lent is a time for “a turnaround,” to convert and change for the better. Lent calls people to live more fully their Baptism, which brings new life, he said. “It invites us to not get used to the situations of degradation and misery that we encounter as we walk along the streets of our cities and towns. People also get too used to living in a culture or society that pretends it can do without God, and where parents, grandparents and adults no longer teach children how to pray, he said. Christians need to overcome their indifference, “this addiction to un-Christian and easy-way-out behaviors that drug our hearts,” he said.